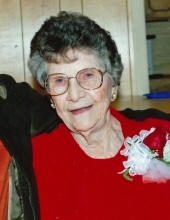 Grace Tarrant McAlpin, age 100, of Bullard, passed away February 5, 2019 in Tyler. She was born January 11, 1919 in Bullard, Texas to Hugh “Tom” and Willie Belle (Cole) Tarrant. She was preceded in death by her husband, Morris McAlpin; son, Jerry McAlpin; sister, Rachel Smith and a brother, Temple Tarrant. Left to cherish her memory is her daughter-in-law, Suzanne Alexander of Athens; brother and sister-in-law, Billy Joe and Flo Tarrant. She is also survived by a granddaughter, Natalie McAlpin of Hammond, LA; special friend, Charles “Sonny” Overguard of Claremore, OK; and nieces: Barbara Jo Odom and Faye Lynn Ryan, both of Bullard, T-Nina Herman of Berne, IN, Donna Van Dusen of Flint and Deanna Etter of Spring; and nephew, Gary Tarrant. A funeral service is scheduled at 11 o’clock in the morning Friday, February 8, 2019 at Church of Christ in Bullard. Randy Marion and Doug Dupree will officiate. Visitation will begin at 10 a.m. Services are under the direction of Autry Funeral Home in Jacksonville. Mrs. McAlpin will be laid to rest at Flint Cemetery. Pallbearers will be Tony Foster, Charles Ray, Connie Vaughn, Clint Ray, Cliff Ray and Aaron Luscomb and honorary pallbearer, Bruce Stripling. If desired, memorials may be made to Bullard Church of Christ Building Fund at P.O. Box 234 Bullard, Texas 75757. "Email Address" would like to share the life celebration of Grace McAlpin. Click on the "link" to go to share a favorite memory or leave a condolence message for the family.